VANCOUVER, BC / ACCESSWIRE / March 12, 2019 / Norsat International Inc. (''Norsat'' or ''the Company''), a provider of unique and customized communication solutions for remote and challenging applications, today announced the launch of a family of products and solutions to address interference issues for the forthcoming introduction of 5G within the C-band spectrum. · 3200-BPF - This family of C-band phase-locked loop (PLL) LNBs can mitigate 5G signals up to -20 dBm with no performance degradation. This high-performance LNB can be used in conjunction with our BPF-C filters for greater rejection. · Custom LNB and Filters - As every installation is unique depending on the antenna position relative to the 5G source, Norsat can also provide custom variants of these products to meet special requirements. · Solutions - Norsat offers consulting services to provide complete solutions for existing networks experiencing 5G issues. 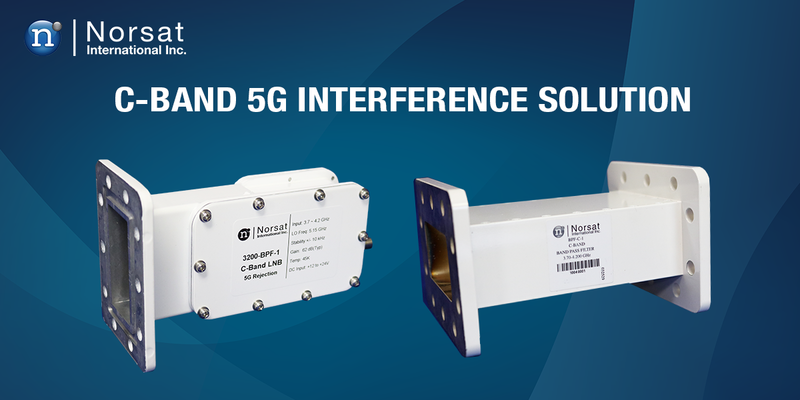 ''We are excited to bring these new products and solutions to market to address the increasing issue of 5G interference on C-band ground terminals. Norsat is a pioneer in the satellite industry and has been working through interference issues on satellite terminals for years. We are pleased to be part of the coordination effort to ensure a smooth transition of 5G into the C-band spectrum,'' stated Dr. Amiee Chan, President and CEO of Norsat. Norsat's customized communication solutions include leading-edge product design and development, production, distribution and infield support and service of fly-away satellite terminals, microwave components, antennas, Radio Frequency (RF) signal conditioning products, maritime-based satellite terminals and remote network connectivity solutions.